In my continuing efforts to keep interested people informed on the latest information about Avastin, I requested and received permission to re-publish the following article that originally appeared in the August 7th issue of Ophthalmic Market Perspectives. Amidst a controversy about treatment prices, the NIH is considering funding a study to compare results of AMD therapies with Lucentis and with Avastin. Lucentis, Genentech's long-awaited anti-angiogenic therapy for age-related macular degeneration (AMD), received FDA regulatory approval on June 30, and the Company immediately shipped $10 million worth of the drug. However, the rosy prospects for Genentech and for wet AMD sufferers took a more convoluted path in mid-July. The US National Institutes of Health (NIH) indicated it was considering funding a clinical study that compares the efficacy of Lucentis with that of Avastin, Genentech's anti-cancer agent that has also shown very positive results in off-label use against wet AMD. In terms of both science and medical advancement, the two drugs might seem to present a win-win situation, but the reality of the marketplace creates a decidedly more complicated scenario. Genentech, a biotech powerhouse, has created two drugs that may each offer a quantum leap forward in successful AMD treatment, yet the Company faces a unique situation in which its own highly-successful anti-cancer drug may undercut the revenue stream of its proven anti-AMD agent. The crux of the issue is money. Genentech developed Avastin and received FDA regulatory approval for its use as a systemic treatment for colorectal cancer. Avastin is central to the Company's revenues-both present and future-and the drug is currently involved in scores of trials concerning as many as 25 types of tumors. It is also used off label for some cancers. Recognizing that the anti-angiogenic Avastin molecule might have potent applications in AMD, Genentech created Lucentis by deriving a fragment from the larger Avastin molecule. This smaller fragment was genetically engineered to create a higher binding affinity than Avastin and to penetrate the retina more effectively when administered by intravitreal injection. As Lucentis made its way through FDA clinical trials, some doctors were impatient to offer real help to their AMD patients. Buoyed by promising reports regarding the closely-related drugs, they began treating wet AMD patients with intravitreal injections of small amounts of Avastin, an off-label use of the drug. As evidence of positive outcomes accumulated, the practice spread. Now, with Lucentis available in the marketplace, pricing for AMD therapy is causing quite a stir. Clearly, Genentech has invested significant R&D dollars in both Avastin and Lucentis, including years of testing and clinical trials. Avastin is currently sold as an intravenous treatment and commonly costs a colorectal cancer patient approximately $50,000 per year. 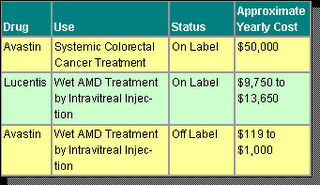 Lucentis is injected intravitreally and typically costs an AMD patient between $9,750 and $13,650 per year. But here is the rub-when Avastin is used in the small dosages appropriate for intravitreal injection in AMD patients, the yearly cost is less than $1,000. There is an enormous difference in price between these two AMD treatments. As health care providers, insurers and public health systems in many nations feel the pressures of mounting health care costs, there is clearly incentive for further examination of AMD therapy using Avastin. Meanwhile, the NIH has given no timetable for its decision about funding a comparative study, but if the study takes place and if Avastin is proven to be as effective as Lucentis, findings may jeopardize Lucentis' future earnings. However, these are big "ifs," and any study will take years to conduct. At present, doctors may choose between two Genentech drugs that appear to be remarkably effective against wet AMD. One, Lucentis, is used on label and is eligible for reimbursement; the other, Avastin, involves non-reimbursable, off-label use that might increase a doctor's liability if anything goes wrong. For the time being, Lucentis has a clear edge in the marketplace.